We continue with the stones of Titler. There were two stones one was an Allgood and the other was a Blacketer. I have seen this surname spelled "Blacketeer." 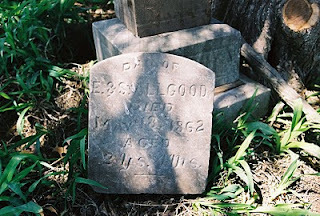 This stone in the photo below is Allgood. The next stone was the surname Blacketer. I refer you to the 1856 Iowa State Census and you will find Merrifield and Blacketer names in that census. Please be reminded that the photos are not alterred so you can copy them and try working them in your photography software to read them better. Please give me credit for the photo and provide a link to this blog. 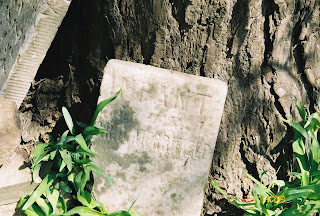 The Stones of Titler Cemetery - Merrifield! 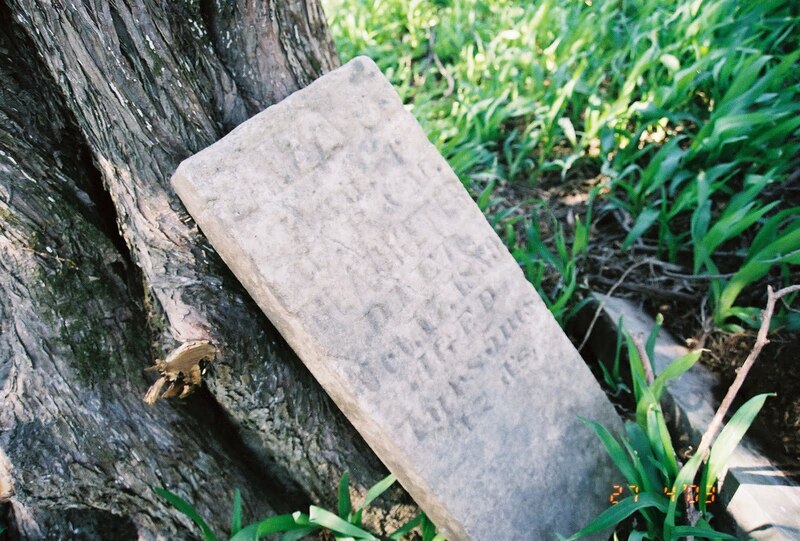 In the next posts I will present the photographs of some of the tombstones that I took back in April of 2003. This is not going to be a complete set of photos. I was traveling and didn't have time to spend formally documenting this cemetery. Please keep this in mind. I gave you publications suggestions for this cemetery in a previous post so that should help you to see if there are any burials that are of interest to you. Please note that I took these photos and have uploaded them here without altering them in any way so that you can take the photo and study it further or make copies to try and read it yourself. Please give me credit for the work I have done by putting a link back to this blog on the pictures you take. 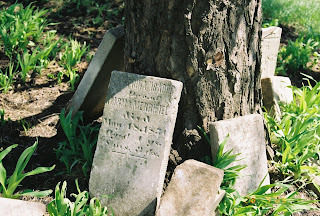 Notice in the above photo that the tombstones are gathered against the tree. 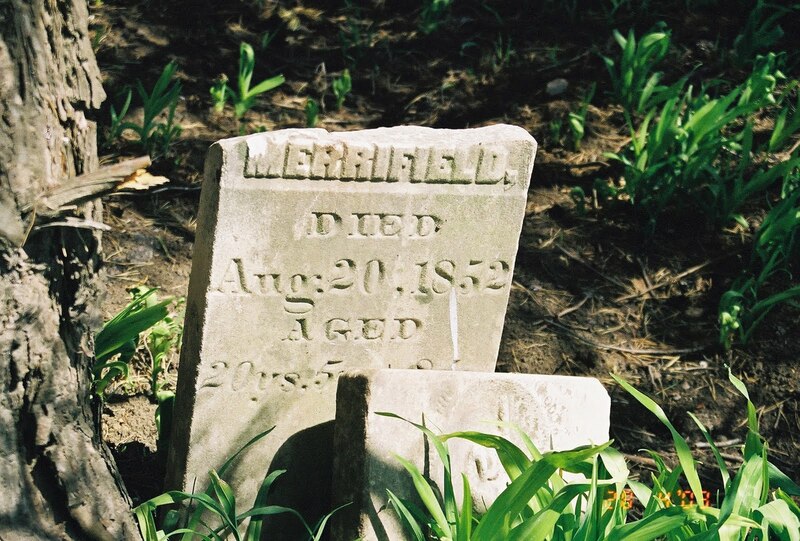 It means there is a disconnect with the burial location of this person in the cemetery. There are depressions in the ground where a grave is located but the stones are not with the grave but placed under trees in various areas of the cemetery. Not all of the stones are in this condition. 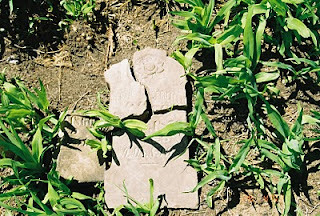 There were pieces of broken tombstones as you see in the photo below to the left of the pieced together tombstone that are probably from another tombstone. 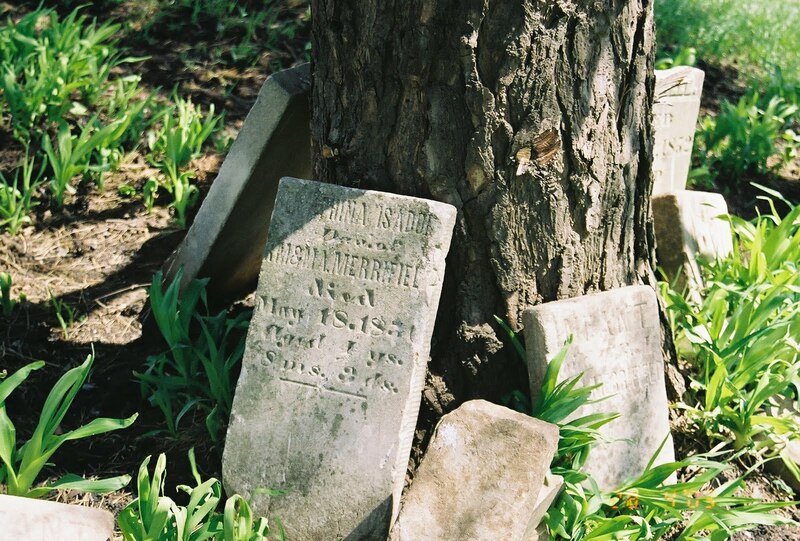 I struggled to not touch the tombstones and do any rearranging for I do not live in the area and I was hoping that others would take on the job of cleaning up this cemetery. 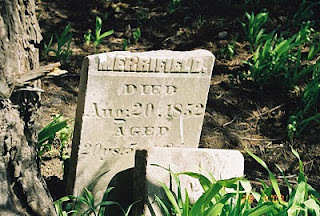 According to Ms. Lillie and Mrs. Sanchez these are the 4 tombstones that are under the surname of Merrifield as listed in their publications. 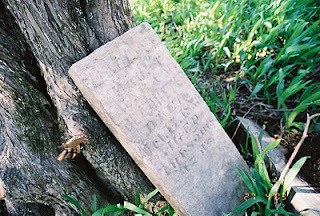 I feel that the stone for Seraphina Isador is closer to the correct name and owner of the stone. Tips on Finding a Cemetery! 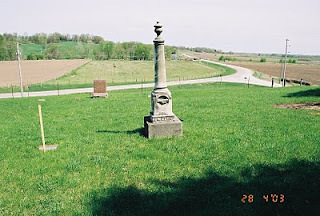 4) On my visit in April of 2003 to Iowa, I asked one of the volunteers at the Iowa County Genealogical Society for a location and a description of how to get to the Titler Cemetery. It is always helpful to get additional information from those who live in the area about the location of a cemetery especially if it is small. The Iowa County Genealogical society used to be in the basement of the Marengo Public Library which apparently remodeled in 2007. So they have moved their library and holdings to the town of New English. Note: Be careful there are Iowa Counties in other states and you can go to the wrong site when you are surfing the internet. So always confirm the location before you start studying the website. 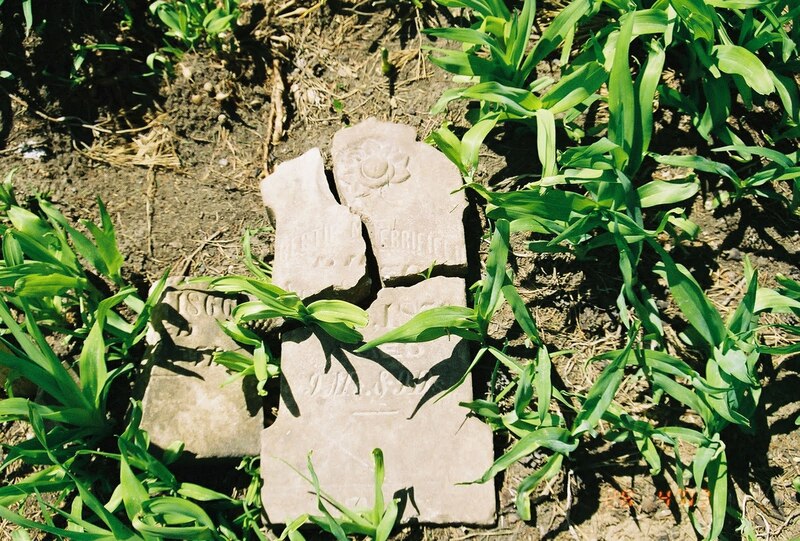 5) Here are some more additional links to information in Iowa that can be helpful for research and finding cemeteries. They have the WPA cemetery project for Iowa. 6) Just Google It! To find a cemetery you can try the Google search engine or a search engine of your choice and you might be surprised at what you find. I got about 4 hits on Titler. This website is helpful in giving a listing of cemeteries in a location or one specific cemetery. You click on Search Domestic Names and it gives a list with location, longitude and lattitude etc. Then it gives you map choices for locating the cemetery. Experiment with different names and types of feature classes like: Cemeteries, Churches or more. 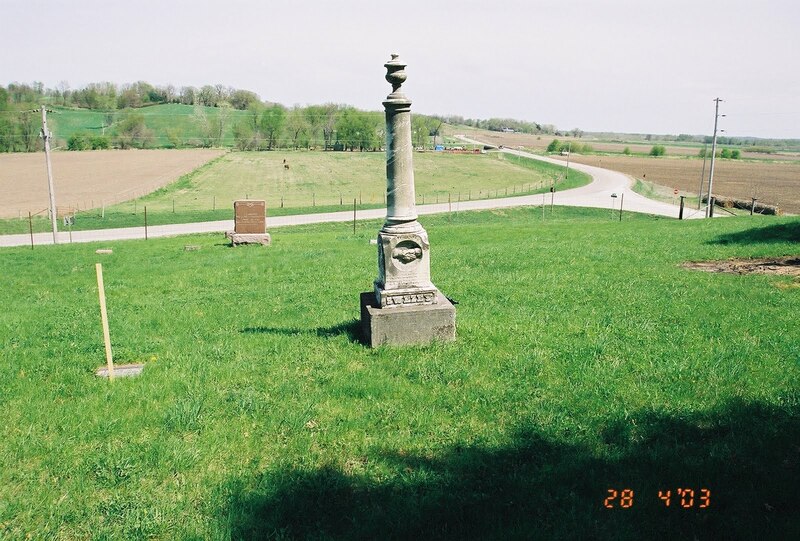 I did a search for cemeteries in Iowa County, Iowa and it came back with 63 cemeteries. They do not have everything but it is a good start if you are having trouble finding cemeteries. 11) Find maps of the area like township Altas' and they probably will show old cemeteries. These would be books found in genealogical, historical, state archives etc. There will be more tips but this should get you started. Photo: View of Titler Cemetery towards the highway and Marengo, April 2003.